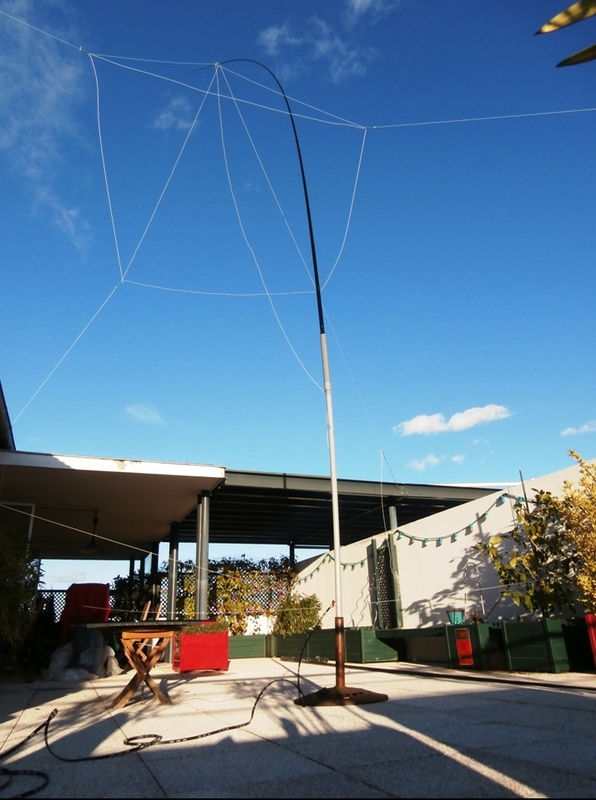 Saturday 22-Feb-2014 was a beautiful day at my QTH in the south of France. A good time to do some antenna experiments, as I am on an eternal quest for a "small DX-antenna" (an oxymoron?) for 80 mtrs. I had been reading up on umbrella antennas, as they supposedly can provide decent performance for their length ( = height). 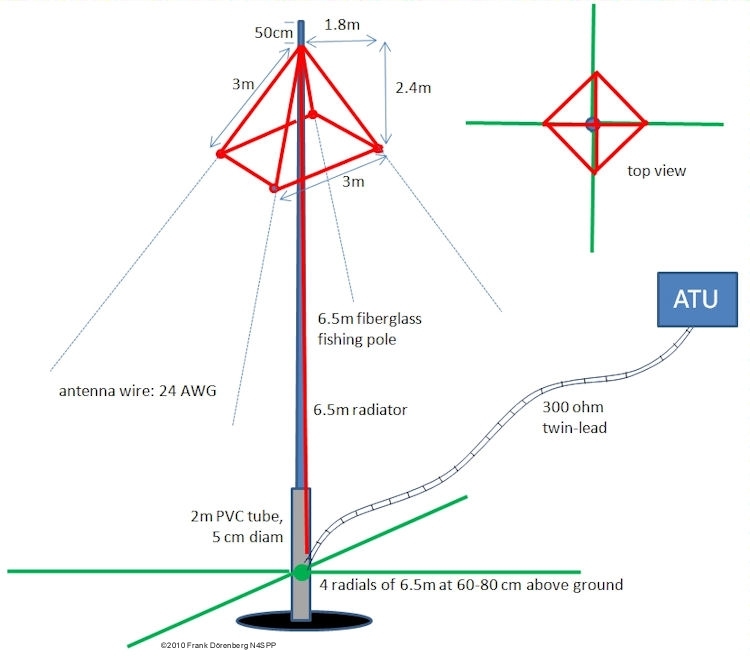 An "umbrella antenna" is basically just a vertical monopole antenna that is top-loaded with a large "end-hat". 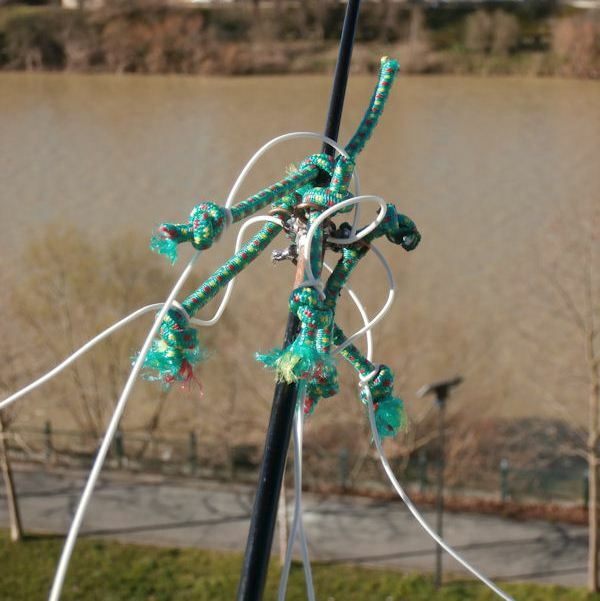 The hat consists of a number of radial wires that slope away, downward from the top of the antenna. These spoke-wires resemble the ribs of an umbrella, hence the name. The beneficial effect of the spoke-wires is significantly increased (as much as 2x) by interconnecting the tips of these wires with a perimeter "skirt" wire. A properly dimensioned hat will make the current distribution along the vertical radiator more uniform. That is, the current will taper off much less towards the top of the radiator. See ref. 7 and the Simulation Model section below. This increases the radiation resistance of the antenna, and also the bandwidth - both highly desirable! 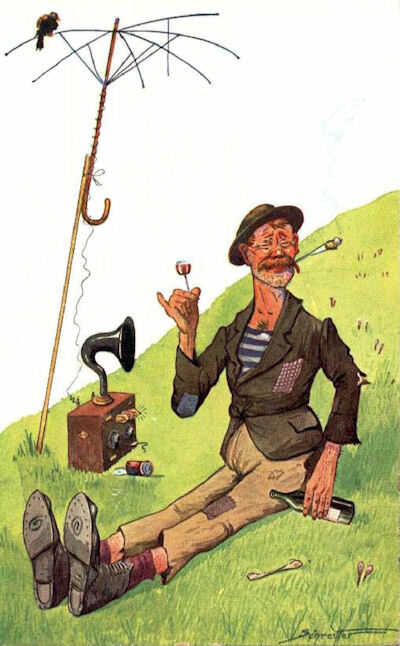 Umbrella antennas are nothing new, they have been used at least since the early 1900s. My favorite umbrella antenna system was the one built for the German navy in WW2, for their "Goliath" 1 megawatt VLF (15-60 kHz) transmitter. That is a wavelength of 5-20km (3-12 miles)! The vertical radiators, despite being 204 m tall (≈670 ft), were still very short: only about 1% of the wavelength! 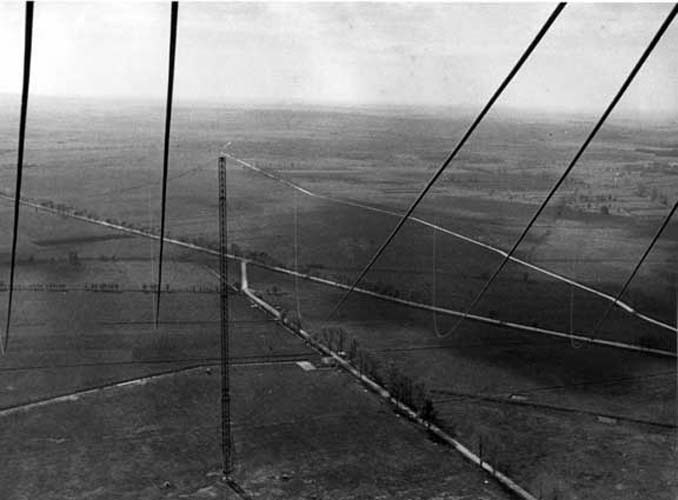 However, the efficiency of the complete antenna system was an impressive 47% at 15 kHz and 90% at 60 kHz. 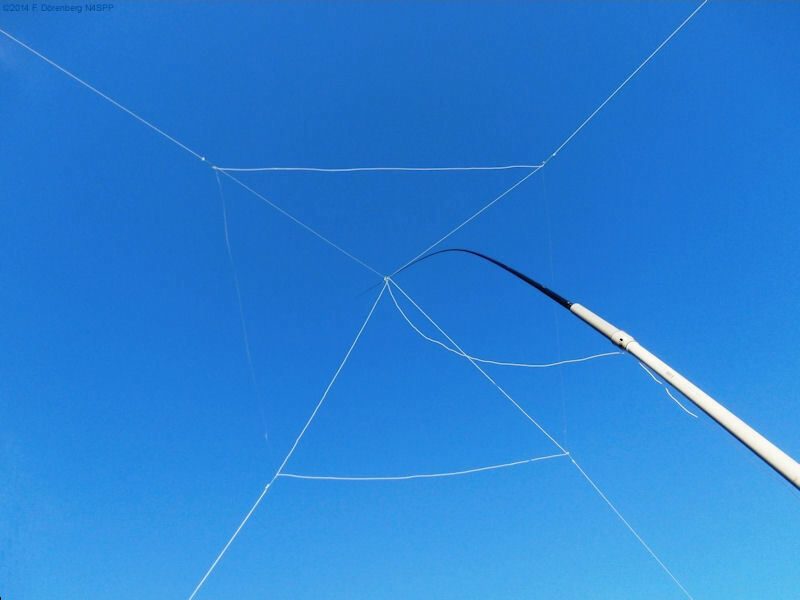 From other antenna experiments, I have two telescopic fiberglass fishing poles at my disposal. One with a total length of 6.5 meters (21 ft), the other 9.5 meters (31 ft). And I had a spool of thin multi-strand wire (≈0.5 mm, 24 AWG). Unfortunately the wire is teflon coated, which is a little hard to work with. I decided to go with the 6.5 meter pole, and attach four loading wires about 0.5 m below the tip. The top section of the telescopic antenna is just too thin and floppy. The wires should not descend by more than about 40% of the length of the vertical radiator (see ref. 2, 4). In my case, that equates to about 2.4 m. Given the size of my terrace (incl. potential attachment points for the guy wires), I decided to slope the loading wires at an angle of about 40°. This makes the wires 3 m long (10 ft), and they can be interconnected with a skirt wire sections of the same length. I added four radial wires of the same length as the vertical radiator (6.5 m). Their length is primarily driven by the dimensions of my terrace, and is not necessarily optimal for the length of the radiator + umbrella. I decided to install the fishing pole "mast" on top of a 1.8 m PVC tube (5 cm diam. ), though the standard approach seems to be that the vertical radiator starts at about 0.5 - 1 m above ground level, with the radial wires attached at the same level. Now, how do you attach the radiator and loading wires of the antenna, to the tip of the fishing pole? The fishing pole is conical: wide at the bottom, very narrow at the tip. The pole consists of several sections, one sliding into the next. So I took 5 cm copper tubing (1 cm OD, 3/8"), and used heavy installation wire to make four lugs. See photo below. The lugs are soldered to the tube, and the 4+1 wires are soldered to the lugs, close to the tube. The lugs are actually for attaching 10 cm (4") long pieces of elastic "bungee" cord, to make strain-reliefs for the loading wires. I added similar load-reliefs at the four points where the loading wires are soldered to the skirt wire. The four guy wires (thin Dacron rope) pull on those reliefs. After a couple of hours of cutting and soldering wire, the wire spaghetti was installed onto the fishing pole, and I raised the antenna into its mast holder. Not easy (by myself), as the wind picked up late in the afternoon. 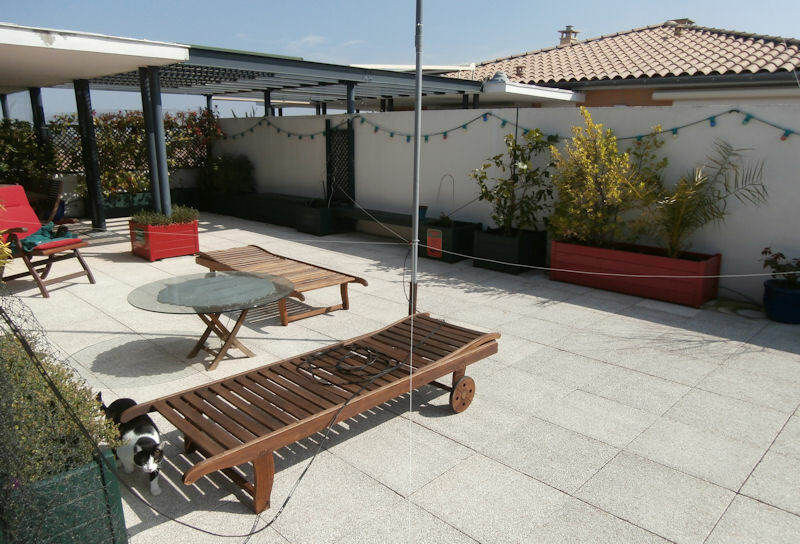 It became immediately clear that I should have taken the 9.5 m pole, and only used the lower 6.5 m part of it: the tip of the 6.5 m pole bent quite a bit under the load of the wires, from the guy-wires pulling down on it, and from wind load. The 6.5 m pole is only 4 mm wide where the wires are attached - the 9.5 meter pole is 2 cm wide at that point, and rigid. As a result, the radiator wire was dangling a bit in the air, and came down to well below the bottom of the pole. Actually, this wire came down all the way to about 60 cm above ground. So I attached the radial wires at that level, rather than at the bottom of the pole - about 1 m higher up. An 8.5 m section of 300 ohm twin-lead connected the antenna to my automatic antenna tuner. 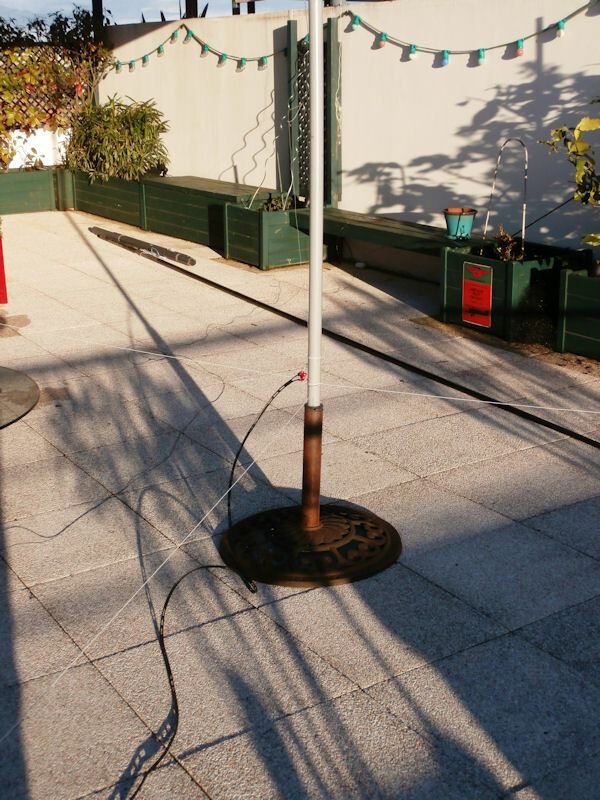 Around 18:00 local time (17:00 UTC), the antenna was ready to be fired up. First I checked all bands from 80 - 10 mtr, to see if my automatic tuner had any problem loading the antenna. It did not, though on 80 mtrs, it did take significantly longer than on all other bands. On 40 mtrs, signals were noticeably stronger than with my 2x7m dipole. On 10 mtrs, a station from Bogota/Colombia came in very strong. On 80 mtrs, QRM was around S9, as is basically the case with all antennas at my QTH. 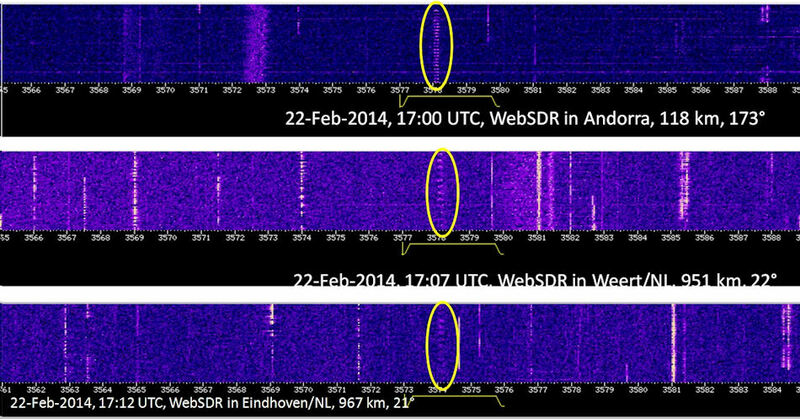 I used several Web-SDRs to check my signal. The waterfall diagrams below show that my signal (50 Watt, series of "E" characters in Hellschreiber format) is getting out quite well on 80 mtrs, both regionally and DX! This shows that the radiation pattern has a small take-off angle - just what I need! I also hooked up my miniVNA antenna analyzer at the feed point of the antenna. See the plot below. 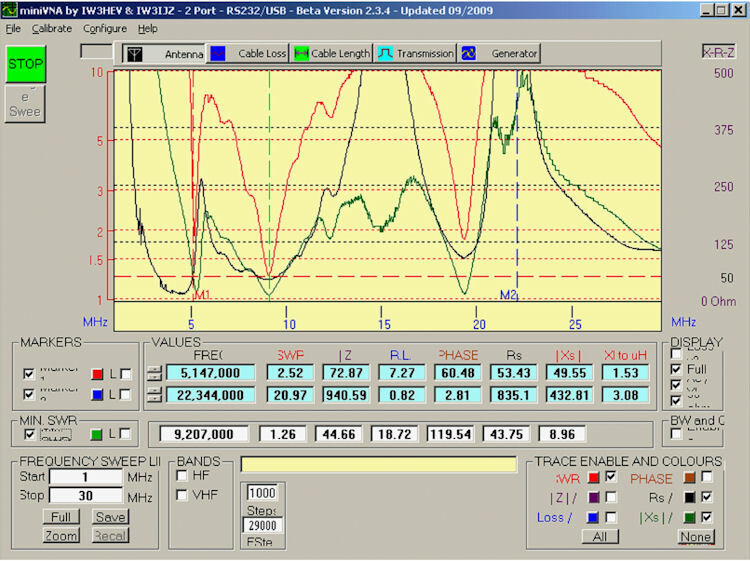 SWR dips below 1.5 around 5 and 9 MHz, and below 2 around 19 MHz. 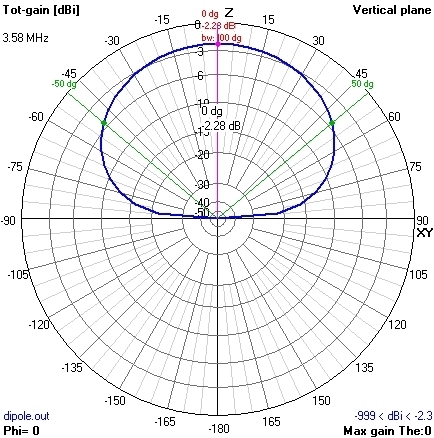 Note that the resonance dips are wider than what is typical for short antennas. Next steps: make a wire-attachment tube for the 9.5 mtr pole, use the bottom 6.5 m part of that pole, and do transmission experiments on bands other than 80 mtrs. 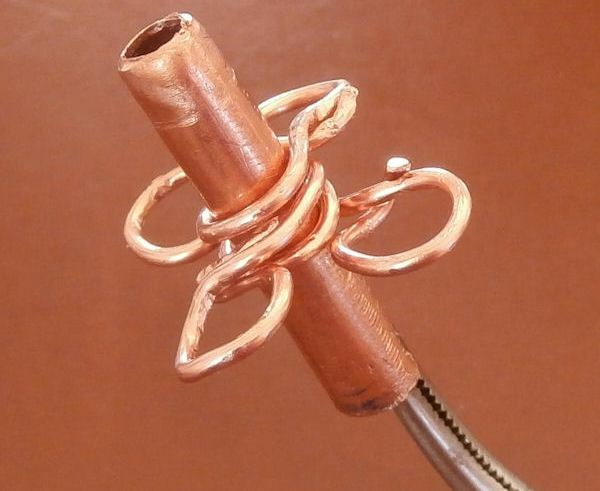 And possibly try a loading coil at the base of the antenna, to move the lowest resonance frequency down to around 3600 kHz. 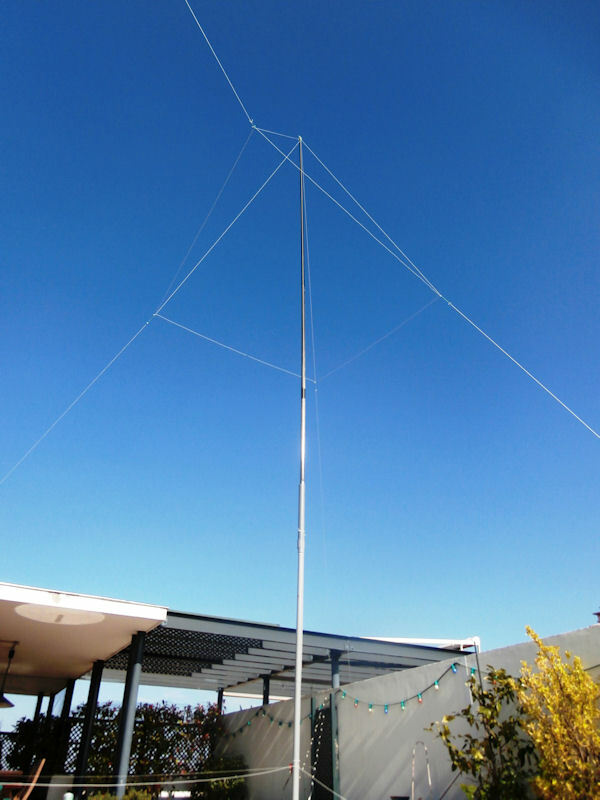 Early March 2014, I transferred the wiring to the 9.5 mtr pole, and resurrected the antenna. Much better - the pole does not bend! However, if I would make a permanent installation, I would probably add guy wires about 2/3 of the way up the mast. The lower 6.5 mtr part of the pole is again inserted into my pole-holder: a section of PVC pipe, 50 mm outer diameter, mounted atop a 2m section of PVC tube with 32mm diameter, via a 50-to-32mm adapter piece. Again, the radial wires are attached at about 80 cm off the ground. Closer view of the umbrella "hat"
Rather than making a new bungee-cord "spider", I re-used the one from the initial version of my antenna, and simply clamped it onto the tip of the pole with a regular pipe clamp. The resonance frequencies did move a little bit - no surprise. The SWR dip around 5 MHz went up from around 1.3 to almost 3, the dip around 19 MHz went down from about 2 to 1.2. For non-resonant operation of the antenna, this makes no difference. I tried to check if there is a high voltage along the radial wires. While transmitting a 50 W carrier, I ran a small fluorescent tube along the wires - it did not light up. OK, I only did this in the 80 and 40m band, not at one of the resonance frequencies. Fur fun, I decided to model the antenna with the 4NEC2 program (excellent freeware). The NEC-file is here. The results are shown below, for "average ground". The first and third dip of the SWR-plot correspond to those that I measured. 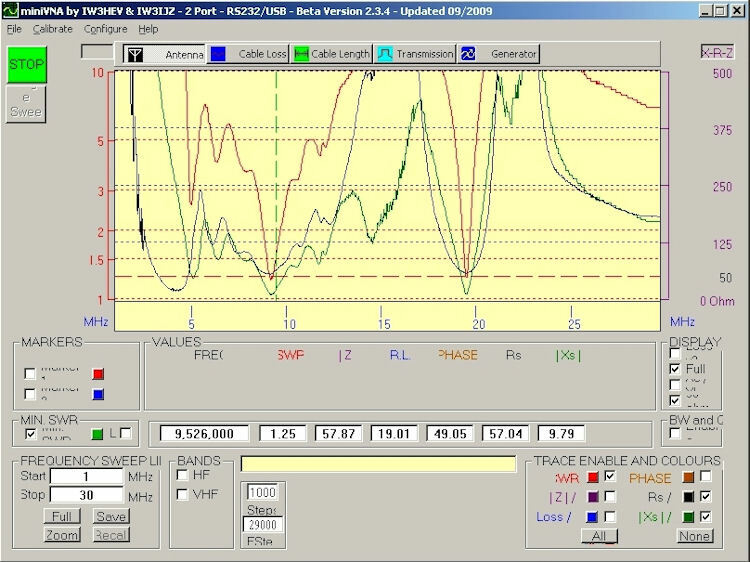 The analyzer plots above show some additional ups & downs (6-8 MHz, 11-13 MHz). 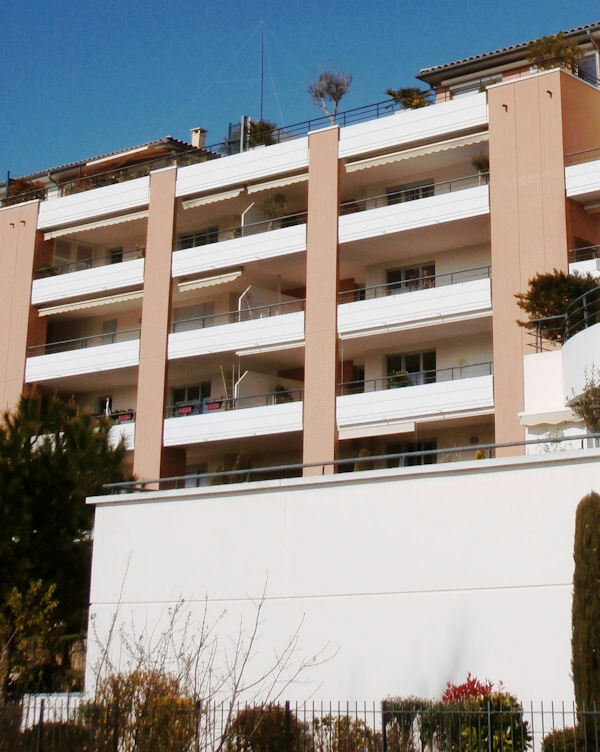 I believe that they are caused by the building structures near the antenna (steel-reinforced concrete walls, long steel railings of the terrace, large steel pergola, ...). For 3.5 MHz, the calculated radiation patterns below show the relatively low "max gain" take-off angle (here: 35 degrees) that I had already concluded from my transmission tests. Maximum total gain is about -2 dBi. Note that this maximum gain is (only) about 4 dB below that of a full-size (λ/2) dipole in free-space, and 0.3 dB above that of such a dipole that is installed horizontally at 2.4 m (8 ft) above ground (3% of λ). The NEC-file is here. The latter horizontal dipole actually sends most of the energy straight up into the clouds: its take-off angle is much higher than that of the umbrella antenna. For comparison, I removed the "umbrella" from the model. What is left is just a short vertical antenna. The NEC-file is here. The radiation pattern, including the take-off angle did not change... However, the resonance-dips in the SWR plot shifted significantly, as did the impedance plot. The geometric model and calculated SWR-plot without the umbrella "hat"
The actual analyzer plot shows similar shifts: the dip with the lowest frequency is now around 10 MHz, both in the model and in the actual measurement. Note there is a large difference between the "umbrella" and the short vertical, regarding the current distribution along the vertical radiator. With the umbrella, the current-distribution is much more uniform, which is desirable. Performance is related to the surface area between the current-distribution and the radiating wire: the bigger that surface area, the more radiation. Clearly, without the perimeter wire, the umbrella is less effective. The short vertical antenna has a triangular current distribution that tapers to zero at the top of the radiator. This means that the upper part of the radiator contributes less to the effective radiation, than the bottom part. Ref. 8A: "An experimental look at ground systems for HF verticals", Rudy Severns (N6LF), in "QST", March 2010, pp. 30-33.